Organizations are rapidly adopting digital strategies to better win, serve and retain customers. As they do so, forward-thinking companies are embracing cloud-native platforms to help accelerate business automation, harness new customer insights and widen their competitive advantage. 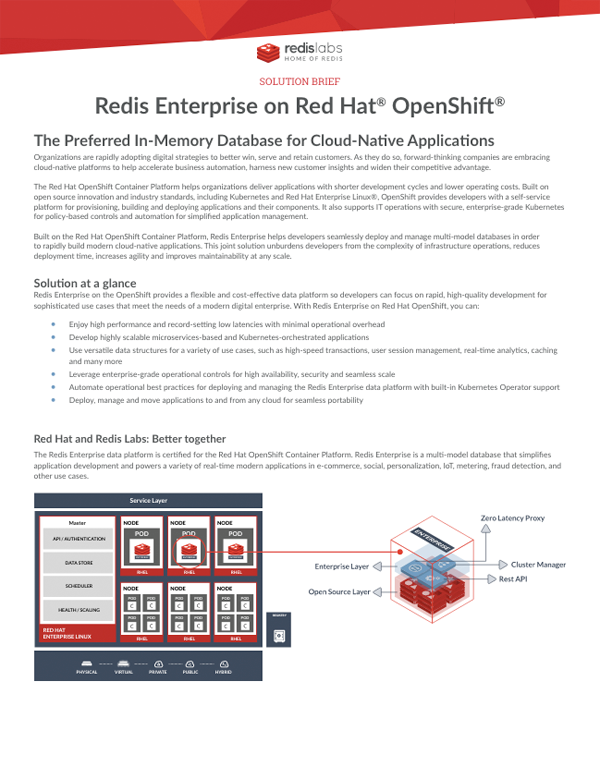 Built on the Red Hat OpenShift Container Platform, Redis Enterprise helps developers seamlessly deploy and manage multi-model databases in order to rapidly build modern cloud-native applications. This joint solution unburdens developers from the complexity of infrastructure operations, reduces deployment time, increases agility and improves maintainability at any scale.